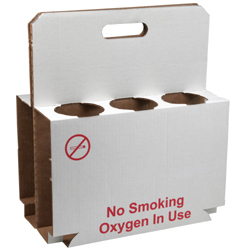 The Roscoe Disposable Cardboard Carrier fits cylinder size M6. Printed with No Smoking symbol with a 6-cylinder capacity. The Roscoe Medical Disposable 6 M6 Cylinder Tote fits cylinder size M6. Printed with No Smoking symbol with a 6-cylinder capacity.